Ben was diagnosed with Spina Bifida and hydrocephalus at birth. When Ben was born the leison on his back was open, this was closed at 2 days old. At four days old he had a shunt put in situe (to drain the excess fluid from his brain) as the spinal fluid was still leaking from the lesion even though the lesion had been surgically closed. Due to the severity of Bens Spina Bifida he is unable to use his legs and relies on a wheelchair to get around, he also has some fine motor problems. 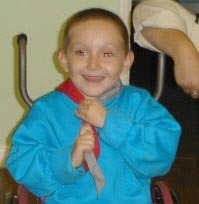 When Ben was first born we were told that he would not sit, possibly feed himself, or even attend mainstream school. Ben now enjoys attending his mainstream school (is in the same class as Pal Nicole B) and enjoys mixing with others and Ben goes to an after school club one day a week. Ben has recently joined the local Beavers group. Ben has “Moved on” from Post Pals. Thank you to everyone who has sent him post over the past 2 years. A huge thank you to Julie and Alan for the continuous smile they put on Ben’s face. Ben is now home from sunny Spain. We had a fantastic holiday, it was the break that we all needed. Ben found the different culture a bit strange, but he soon got used to it. We went out for meals every night but Ben didn’t like the fact there were lots of street sellers around as he said they were bugging him. Ben is slowly coming to terms with the sudden death of his dad. Ben has just been doing a week of sats tests and has found it very difficult and has been very tearful about it today. On wednesday Ben is flying out to Spain for a weeks holiday with my new partner, his daughter and myself and we are all really excited. When we come back, Ben will be joining cubs (the next step up from beavers and I am in the process of looking into changing Ben’s school as the older he is getting, the more help in school he is requiring. I had the results back from Ben’s fine motor tests and even though his chronological age is 8 yrs and 5 months, his developmental age has been put at 5yrs and 2 months. Ben has re-joined Post Pals, he is doing well and is a lot bubblier now. Ben is still doing well in school and we have some brilliant news for post pals! Ben is going to be getting 2 brothers and a sister. I have met a new man, who loves us both dearly and we are going to be getting engaged at Christmas. Ben’s new brothers and sisters are older than him, 16, 14 and 10. I hope our news makes you smile as i can’t stop smiling at the moment! Ben’s health hasn’t changed at all. We had a scare the other evening, i had to rush Ben to A&E with pains in his right kidney (it’s his bad kidney) and he was becoming distant and very tired. The consultants were concerned that Ben’s right kidney was possibly starting to fail and he has now been put on strong antibiotics 3 times a day. Ben would like to say thank you to everyone who has sent him post this month. Through the problems we have been having with Ben’s school, I got a speech and language adviser to see Ben, and she has picked up that Ben has got learning disability as well as everything else. It also looks as if he has got a condition called chiari malformation it affects children with hydrocephalus and when their cerebellum is deformed due to the hydrocephalus. This is not common but does happen once in a while. Ben might out grow this or he might have it for life. So this means that Ben can only have smooth, soft textures and if we have proper meat (not packet) Ben will have to have his slightly pureed.